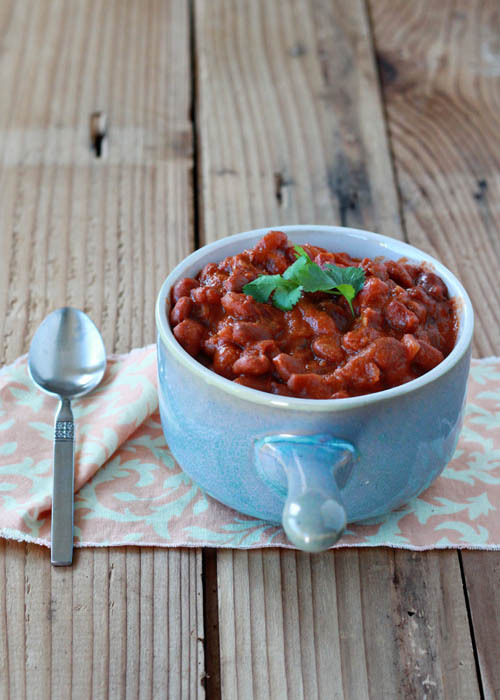 This vegan baked bean recipe is a unique – but utterly delicious – spin on classic baked beans. Curry spices, coconut milk, ginger, and brown sugar help make this easy Crock Pot recipe shine. Perfect for your next potluck BBQ! This vegetarian baked bean recipe is a unique – but utterly delicious – spin on classic baked beans. Curry spices, coconut milk, ginger, and brown sugar make this super-easy slow cooker recipe shine. The eggs were on the lighter side of beige, divided between two plates and ready to eat. “Oh, did you just scramble the whites?” I asked my guy as he diligently prepped the rest of our breakfast. I was busy photographing a batch of muffins fresh out of the oven. I shrugged to myself and kept snapping. He finished setting the table. They weren’t half bad, really. I mean, I’m not sure I’d say they were half good but they were surprisingly edible, if … different. For a moment, I caught myself thinking how cute it was that my guy decided to try something new with food, a habit he’s obviously picked up from his food blogger wife. Then his face fell a little and the confession wasn’t far behind. It was one of those moments that starts out as mildly amusing and then keeps getting funnier. So we laughed between bites of cinnamon eggs and I remembered past blurry-eyed mornings when I’ve brewed up entire coffee pots full of hot water (who needs coffee grounds? ); when I’ve spooned salt on top of my oatmeal instead of sugar; when I’ve accidentally gargled shampoo instead of mouthwash. Yeah, that happened. Sometimes strange food combinations don’t work, but sometimes they really, really do. 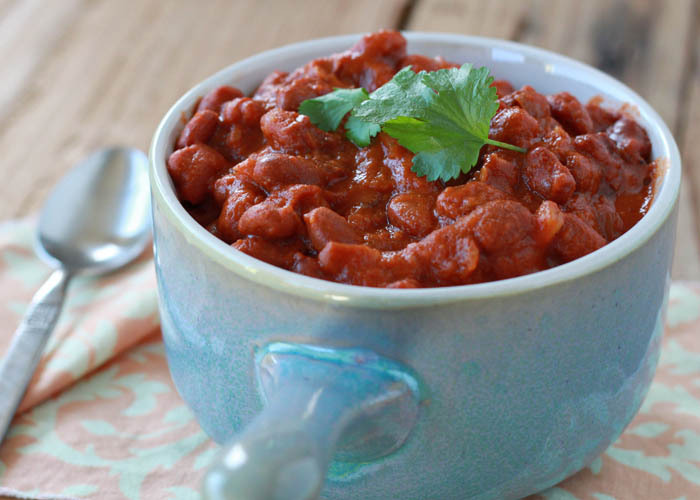 These coconut curry baked beans aren’t the result of a brain glitch, but the first time I decided to throw this particular combination into the Crock Pot, I knew they could go either way. Luckily, they went the right way. They have all the best properties of baked beans – rich, tangy, a touch of sweet and a bit of heat – without getting too weird. The curry spices definitely stand out, and a bit of heat builds with every bite. The flavor of the coconut milk is mostly lost, but it does lend a wonderful creamy texture that can’t be beat. They’re different, but good different. Oh, and I know, I know – a Crock Pot recipe in June? But if you haven’t discovered the beauty of the slow cooker in summer, I daresay it’s time you do. On intense summer days, the Crock Pot helps you avoid the hot stove and, overall, creates very little heat in an already-sweltering kitchen. I’ve started cooking my beans from dried instead of using canned, and I love it! The beans taste better, and you can’t beat the savings. I cook up a couple of pounds of dried beans at a time, and freeze them in two-cup increments. For this recipe, I just pull four cups worth out of the freezer, but you can use canned, too. 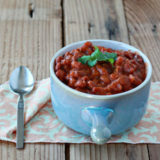 If you cook up a pound of pinto beans from dried for this recipe, you’ll have about two cups of cooked beans left over. Perfect for a quick lunch, or stick them in the freezer for next time. Add beans to Crock Pot. Add the olive oil to a large skillet over medium heat. Saute the onions until they begin to soften, about 5 minutes. Add garlic and saute for another minute. Stir in the ginger, curry powder, cumin, crushed red peppers, and salt. Reduce heat to low and stir in the coconut milk, tomato paste, and brown sugar until tomato paste is evenly distributed. Pour over beans and toss gently until beans are coated. Also potluck-friendly, this coconut banana bread would make an excellent precursor :: These spiced corn & chickpea samosas from Naturally Ella look like they’d be the perfect accompaniment :: Or pick up Trader Joes‘ oh-so-good vegetable masala burgers to serve alongside :: And for dessert, these absolutely gorgeous mango lassi popsicles from Cooking Stoned would be pretty dang perfect. I would never think to do something like this, but I can see how it would work out so well. 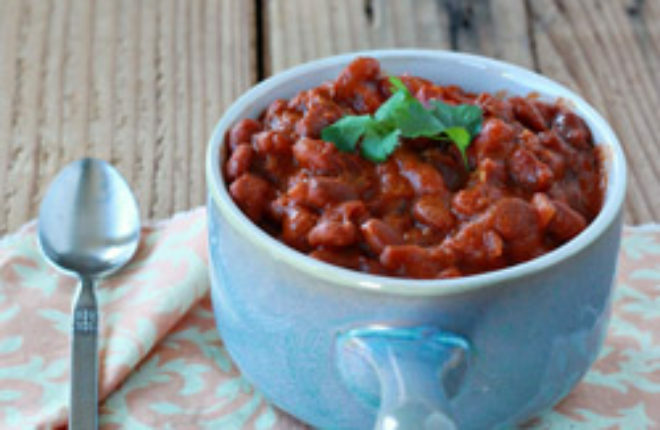 Indian-inspired baked beans: it just makes sense! The eggs really were surprisingly edible. Yum! Loved baked beans, love curry and love my slow cooker! 🙂 Great idea to use it on hot days rather than turn the over on. I also love your “make it a meal” future! Such a cute (and helpful) idea!!! I’m just wondering – if the beans are already cooked, why do they need 8-10 hours in the crock pot? Won’t they lose their shape by that point? Using already cooked beans as a starting point for baked bean recipes is actually very typical. When I started making them from scratch, I wondered the same thing! 🙂 I’m not an expert on the science behind it but slow-cooking already-cooked beans in a sauce allows the beans to soak in all of those delicious flavors and really develop their typically wonderful, creamy consistency. A few of the beans might break down in the process (and that probably helps with developing that creaminess) but most of them maintain their shape wonderfully. I found this recently thru Kayln’s Kitchen, I’ve made beans 4 times in the last two months. I keep meaning to share with neighbors but end up eating almost all of it myself. Definitely one of my favorite recipes. Love this recipe (my first one tried since I stumbled upon your blog)! As a college student, I barely have to time breathe, let alone cook an extensive meal – but this perfect! It didn’t take too much time, and it gave me enough servings for leftovers, so I didn’t have to worry about cooking for the next few days. And during the cold, Northeastern winter days, it makes this meal that much more enjoyable. Thank you!! Yikes! Thanks for pointing that out. Definitely a mistake. Yes, it serves about 8. I’ve loved this recipe since I found it about 15 months ago, and have made and tweaked it several times. We’re not vegetarians, though I have strong tendencies that way. I’ve now written/photographed my own version of it on my recipe blog and linked to this post as my inspiration. Thank you so much! We have tried lots of homemade baked bean recipes and all have been an absolute disaster. Until now. These are really amazing, easy to make and taste like really good tinned baked beans only better. We will be doing these again, LOTS!